Each Box contains Three Autographs and Two Memorabilia Cards, on average! One Rare Glass Insert PER CASE! At least one Rookie Premiere Material Autograph Per Box! Pull plenty of multi-swatch madness in Tools of the Trade! Find unique materials from top stars and legends, including jerseys, gloves, footballs, pants, socks, shoes, helmets, hats and jackets! Find autographs from some of Canton's finest in Marks of Fame and HOF Jersey Autos! New in 2017 - Find unique, oversized memorabilia content in Jumbo NFL Shields (featuring the whole NFL Shield from player-used footballs) and Jumbo Cleats (featuring Super Prime materials from player-worn shoes)! Chase rare Glass insert cards, falling one per case, on average! Key Rookies: Mitchell Trubisky, Patrick Mahomes, Deshaun Watson, Christian McCaffrey, Mike Williams, John Ross, Corey Davis, Leonard Fournette, O.J. Howard. 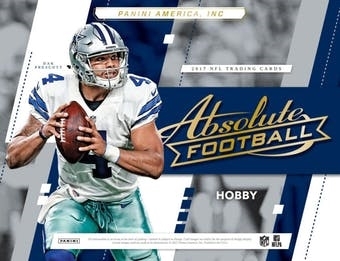 ROOKIE PREMIERE MATERIAL AUTOGRAPHS QUAD/ROOKIE PREMIERE MATERIAL AUTOGRAPHS SPECTRUM/ROOKIE PREMIERE MATERIAL AUTOGRAPHS FIVE: Look for at least one Rookie Premiere Material Autograph per box, on average. Find loads of unique memorabilia! TOOLS OF THE TRADE DOUBLE PRIME/TOOLS OF THE TRADE TRIPLE AUTOGRAPHS PRIME/TOOLS OF THE TRADE QUAD PRIME: Pull iconic Tools of the Trade memorabilia and autographed memorabilia cards! JUMBO NFL SHIELDS/ABSOLUTE JERSEYS PRIME/JUMBO CLEATS:> Find massive oversized memorabilia from jerseys, shoes, footballs and more!